When you’re in a hurry, stressed out, and wrestling with multiple bags and boxes, you just want to get done with your shopping, hop in your car and get home. That may not be as quick or as easy as you think, especially during the holiday season when parking lots are crowded with shoppers. The following tips can help keep you safe and lower your stress level as you head out, and head back home, from your shopping trip. Park and Walk. It may seem like a hassle to park farther away from a retailer’s door, yet doing so decreases the likelihood of your car being scratched or dented by car doors and shopping carts. If possible, avoid spaces at the end of a row because your car is vulnerable to turning traffic. And try to park in front of a light pole. The pole will protect your car from drivers who pull too far ahead in their spot. Plus, parking by a light provides greater security when you’re shopping at night. And if you need more convincing, think about this: Parking farther away means you’ll get some exercise, which is always a good thing. Check Your Surroundings. It’s nice to hop in the car and then use your car’s backup camera to help you exit your parking spot. But backup cameras only allow you to see what’s directly behind your car. There may be shoppers or cars on either side of you, so make sure you turn your head to check. Keep the Noise Down. Loud music and loud passengers can make it hard to hear and to concentrate on your objective: leaving your parking spot safely. Turn down the music and ask your riders to keep their voices down until you’re safely on your way. Accidents Can Happen. If you’re involved in a parking lot accident and the police aren’t contacted, ask to see the other person’s license and insurance card so you can write down his or her name, phone number, address and insurance information. (It’s in your best interest to actually see the person’s license and insurance card in case the driver tries to provide false information.) Write down the vehicle’s color, make, model and license plate number. If possible, take photos of the accident scene so it’s not a “he said, she said” situation later. If there are witnesses, get their contact information as well. Take a Look Around. When walking to and from your car, stay focused on your surroundings. It’s easy to become a target for wrongdoing if you’re distracted. And while you’re at it, be careful it it’s icy or snowy or if the pavement is uneven. You don’t want to end up on the ground. Having too much to do and too few hours in the day can turn most anyone into a grump this time of year. Doing your part to be a mindful and courteous driver can make everyone’s holiday season a little brighter. 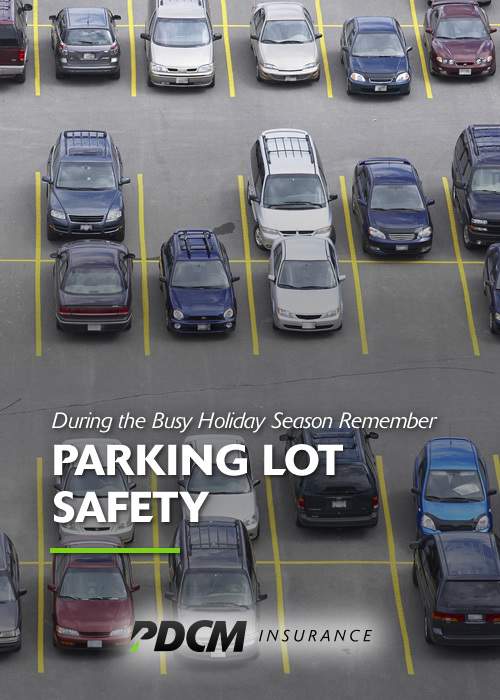 Do you have other tips for parking lot safety? Let us know! December 29, 2015 in Insurance News.